SOFIA (Bulgaria), January 25 (SeeNews) - A vote in parliament that may put an end to a 27-year conflict between two countries, two construction deals worth 868 million euro in total, two banks in trouble and the start of construction of an air base - NATO's first in the Western Balkans, marked the past week in Southeast Europe. The Greek parliament on Friday ratified an agreement with Macedonia on renaming the former Yugoslav republic to North Macedonia with a majority of 153 votes in the 300-seat parliament. The endorsement of the agreement, which aims to put an end to a 27-year dispute between the two countries, opens the way for Macedonia to join NATO and the EU. The ratification of the so called Prespa agreement on the name change, signed in June by the foreign ministers of Macedonia and Greece, was warmly welcomed by the president of European Commission Jean-Claude Juncker, EU foreign policy chief Federica Mogherini and enlargement commissioner Johannes Hahn. 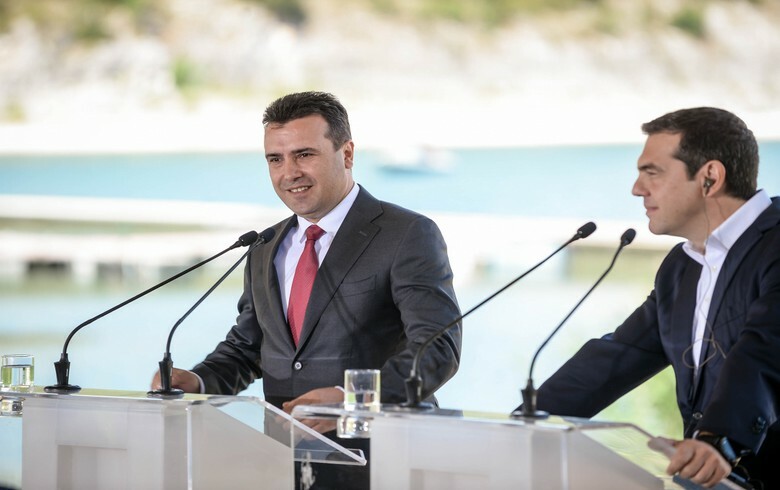 "From the very beginning, the European Union has strongly supported the historic agreement signed by Prime Ministers Tsipras and Zaev, following negotiations under the auspices of the UN. It took political courage, leadership and responsibility on all sides to resolve one of the most entrenched disputes in the region," they said in a joint statement. Both countries have seized this unique opportunity which sets an example of reconciliation for Europe as a whole and will give a further boost to the European perspective of the region, the statement noted. "While we look forward to the next procedural steps leading towards the full implementation of the agreement, we can already say with confidence today that Athens and Skopje have, together, written a new page of our common EU future," it added. Following the vote in the Greek parliament, Macedonia’s prime minister Zoran Zaev congratulated his Greek counterpart Alexis Tsipras. “Congratulations my friend Alexis Tsipras, together with our peoples we reached a historical victory. Long live the Prespa Agreement! For eternal peace and progress of the Balkans and in Europe!” Zaev said in a Twitter post. On January 11, the Macedonian parliament endorsed four amendments to the country's Constitution on the name deal signed with Greece. On October 18, NATO launched formal accession talks with Macedonia. Athens has blocked Macedonia’s attempts to join NATO and the EU for 27 years over the country's name. According to Greece, the current name Republic of Macedonia implies territorial claims on the Greek northernmost province of the same name. A consortium comprising Turkish companies Alsim Alarko and Makyol has won a tender for upgrading a section of Romanian railways with an offer of 2.85 billion lei ($687 million/605 million euro), Romanian railway infrastructure operator CFR said on Wednesday. Some 82% of the funding necessary for the rehabilitation of 28.2 km of railroad between Apata and Cata, part of Brasov-Sighisoara section, is provided from non-reimbursable EU funds under the Connecting Europe Facility (CEF) programme, CFR said in a statement. The remainder will be provided from the state budget. The procurement contract will be signed by both parties following the legal appeal period for the tender. The sub-section is part of the Rhine - Danube Corridor of the Trans-European Transport Network (TEN-T). The project aims to upgrade railway infrastructure and superstructure in those sections to allow for a maximum travel speed of 160 km/h of passenger trains and 120 km/h for freight trains, CFR added. Rehabilitation works will be carried out on bridges, underpasses and tunnels. Also, civil works will be carried out in several railway stations including signalling, optics fiber and electrical installations. This is the biggest modernization project out of seven for which CFR has obtained total financing of 1.13 billion euro ($1.28 billion) under the CEF mechanism in April 2018. Greek construction company GEK Terna has signed a 262 million euro ($297.7 million) contract with France's Vinci Airports for construction and refurbishment works at Belgrade's Nikola Tesla airport, the Greek company said on Monday. The project includes a series of infrastructure overhauls, aiming to develop and upgrade the airport’s capacity and operating conditions, enable airlines to offer new routes and increase passenger and cargo traffic in line with Serbia’s economic growth, based on current and future data, GEK Terna said in a statement. Under the terms of the deal, GEK Terna will be in charge of building a new passenger terminal with a total surface area of 42,000 square metres, refurbishing existing terminal facilities with a total surface area of 15,000 square metres, building a new 3,500 metre-long runway and upgrading the existing 3,400 metre runway. GEK Terna will also expand the existing apron and build new apron infrastructure with a total surface area of 55,000 square metres, expand the existing deicing pads with a surface area of 6,000 square metres and build new car parks with 2,400 parking slots. The Greek company will also build nine taxiways, roads with a total length of 3.5 kilometres and a rainwater drainage system. The construction works will take five years to complete. Vinci Airports officially assumed management of Nikola Tesla airport in December under a 25-year concession agreement signed with Serbia’s government. Under the deal, the French company will pay 417 million euro to the Serbian government and 84 million euro to the retail shareholders of Aerodrom Nikola Tesla for the concession plus an annual fee of between 4.4 million euro and 15.1 million euro. Montenegro's central bank CBCG has extended by 90 days a moratorium on all payments by troubled Atlas Banka [MNG:ATBA], it said. The moratorium was extended by the maximum period envisaged in the law, as none of the existing shareholders of the bank have subscribed for the 22 million euro ($24.9 million) capital hike launched by the interim administrator of Atlas Banka in an attempt to rescue the bank and allow its normal operation, CBCG said in a statement on Thursday. The payment of salaries and other personal income, health and life insurance compensations, as well as recurring costs for the functioning of the bank are excluded from the temporary suspension. Earlier this month, the interim administrator of Atlas Banka offered 88,710 new ordinary shares of the bank with a nominal value of 248 euro apiece for subscription by shareholders with pre-emption rights. The transaction would be considered successful if the entire issue is subscribed for within 35 days after the invitation publication of the invitation on January 16, the interim administrator said at the time. Atlas Banka completed in October a 1.369 million euro capital hike as part of its debt restructuring strategy. After the completion of the increase, the total capital of the bank amounts to 32.028 million euro, and the total number of shares is 64,056. The loan portfolio of the bank amounted to 146.1 million euro, whereas its deposit portfolio totalled 218.4 million euro at the end of September, according to CBCG data. On December 10, the central bank imposed a 45-day moratorium on all payments to depositors and other creditors by Atlas Banka and another troubled lender, Invest Banka [MNG:IBMN], to undertake activities necessary for the continuation of the operation of the banks and the protection of their assets. CBCG said on Wednesday the country's Deposit Protection Fund (FZD) plans to start the payment of guaranteed deposits to the customers of Invest Banka [MNG:IBMN] on January 28. The fund will pay a total of 22.58 million euro ($25.63 million) to 2,730 depositors, including 2,340 citizens, at the branch offices of Societe Generale Montenegro, Hipotekarna Banka and NLB Banka, FZD said on Wednesday. The combined market share of the two banks is just above 6%, central bank governor Radoje Zugic said in December. A total of 16 banks are active in Montenegro. NATO has officially launched works at Albania’s Kucova for establishing its first air base in the Western Balkans, the defence ministry said on Thursday. The Kucova air base, located some 70 km south of Tirana, was built in the 1950s to host the planes of the Albanian Air Force.